English money-lender and philanthropist; born in Birmingham 1837; died in London Jan. 13, 1901. Lewis began work when thirteen years old. He became a salesman of steel pens, then opened a jeweler's shop, and finally entered the business, with which his name was most identified, that of money-lending. He became the most fashionable money-lender of his day. 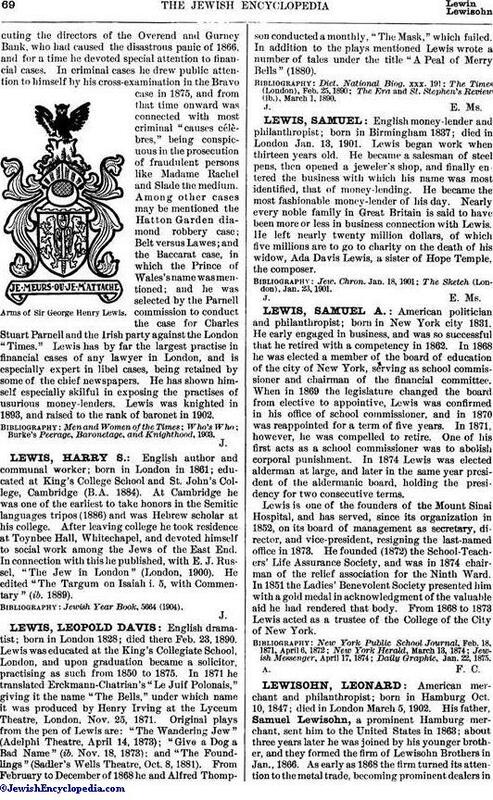 Nearly every noble family in Great Britain is said to have been more or less in business connection with Lewis. He left nearly twenty million dollars, of which five millions are to go to charity on the death of his widow, Ada Davis Lewis, a sister of Hope Temple, the composer. The Sketch (London), Jan. 23, 1901.